Please specify, e.g. rolls, herb bread, foccacia, lepinja etc. Chocolate roulade with raspberry sauce. Pavlova with mango, passionfruit & berries. For 2 hot dishes, 1 salad, bread, dessert. For 2 hot dishes, 1 salad, bread, cheese & fruit. For 2 hot dishes, 2 salads, bread, dessert. For 2 hot dishes, 2 salads, bread, cheese & fruit. For 1 cold dish, 2 hot dishes, 1 salad, bread, dessert. For 1 cold dish, 2 hot dishes, 1 salad, bread, cheese & fruit. For 1 cold dish, 2 hot dishes, 2 salads, bread, dessert. For 1 cold dish, 2 hot dishes, 2 salads, bread, cheese & fruit. For any additional salads add $4.00 per head per salad. For any additional desserts add $8.00 per head per dessert. These prices are for food only and do not include GST which is additional at 10%. 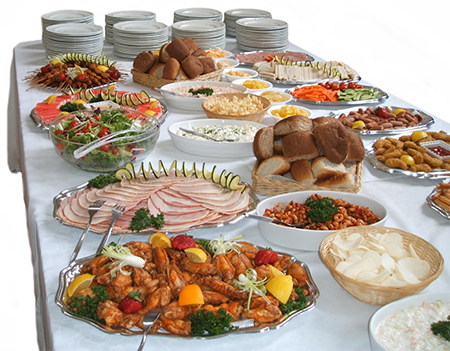 Food is delivered with serving platters, but we do not supply serving utensils unless specifically requested & there is a hire charge for these.